Helping players make a smooth transition from their day into practice is extremely important, especially in youth basketball. Coaches – can you spare five minutes prior to practice to engage the brain, and thus the athlete? Through no fault of our own, coaches have been conditioned to want to immediately “get after it” as quickly as possible in order to maximize time. However, our players are not machines. They are human beings, likely having just sat in class all day and running low on mental and physical energy by the time they get to the gym. At the high school level, student-athletes are thoroughly engrossed in being a teenager, and with the amount of stimuli that technology creates these days, kids have a thousand things on their minds at all times. I have found that using transition games to begin all of our workouts has improved attentiveness, communication, feedback, learning and enjoyment of training sessions. Even more interesting is that when players are responsible for leading their own workouts, this increases engagement even more. Coming up are seven games for warming up your athletes. Each of them provides players with the opportunity to play, react, make decisions, and laugh – yes, laugh. I know this is not a common concept to consider when talking about basketball practice, but before you roll your eyes, understand that laughing increases happiness, which in turn will boost engagement no matter what level you coach. It’s key for youth basketball levels. Let’s be honest, we all perform better when we are having fun. *Disclaimer – I did not make up these games, nor am I claiming credit for their use in basketball practice. They have been borrowed and adapted – thank you to those who shared! 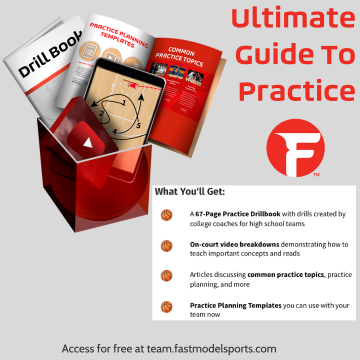 Click to view the Ultimate Guide to Practice! Players jog around the gym in a line. A coach or manager calls out a number between 2 and the total number of players. The players must quickly from groups of the number that was called. Anyone left out has push-ups in the amount of the number that was called. After a couple of reps, switch the positions of the kids who have gravitated to the same area in line. This game is a favorite and really does get the brain transitioning to the workout. Players will line up across from one another in partners. They’ll have a ball between them on the floor. A coach or manager will yell out a body part, such as shoulders, ankles, knees, back, head. On “go” players will attempt to grab the ball and sprint dribble it to the baseline or to the basket on their side. We have gone so far as to have players laying down or touching their partner’s shoulders or ankles. It may sound easy, but players will struggle with staying focused as the game gets more and more competitive. Also known as Pac-Man tag, the rules are simple: stay on a line on the court. Finally a use for those pesky volleyball lines! Make a couple of players “it” who are allowed to go anywhere on the court as they chase everyone else who must stay on a line. Add a basketball for each player to teach dribbling with their head up, staying on a straight line, and jumping from line to line without losing their dribble. Thanks to Coach Brian McCormick for this one. Players line up across from one another with the half court line between them, and play rock paper scissors. The rule is that the loser chases, meaning whoever LOSES is immediately in pursuit of the winner, who has taken off and is trying to get to the baseline on their side of half court before being tagged. Work in in acceleration/deceleration, communication, and teamwork. You’ll also notice players getting into an “athletic stance” naturally as they become more engaged in the game. Add a basketball for each player to make it a basketball-specific transition game, and you could even add that players must score or finish in order to win the rep.
Groups of 6-7 hold hands forming a circle facing each other/the inside of the circle. They can also put their arms around each other, depending on how close you want the circle to be. There is an additional player on the outside of the circle. They will stand behind ANY player in the circle facing the inside, and will be tasked with tagging the player directly across from them in the circle. The players in the circle are responsible for keeping that player from getting tagged – they will change direction, communicate, help shield the player, etc. The tagger will be changing direction, accelerating and decelerating, and striving to find a way to get to that player. Upon being tagged, the player will become the tagger, the tagger becomes part of the circle, and you move on until everyone has been tagged/tagger. Make it extra difficult for the tagger by adding a basketball. Players in groups as large as 4-5 assume a push-up position. Their mission is to tag their opponents’ hands 5 times before they get theirs tagged five times. If you get tagged five times, you lose and have an accountability. This gets players minds moving in sync with their bodies, creates competition, builds strength, loosens muscles, and above all else, it’s fun. Sometimes the best thing you can do for your players is to let them be kids again. Play regular tag within an area of the court. Keep the game moving – once you’ve been tagged, you’re also “it.” Add in movement variations, such as backpedals, lateral slides, two foot hops, etc. Tagger can sprint where they need to go, those who have not been tagged must move in the prescribed way. Add a basketball to level up. These games may seem simplistic – that’s the point. Enjoy those first few minutes of practice before stretching and get the players’ bodies and brains transitioned into workout mode. You’ll be able to see where kids are mentally much quicker by playing a game than jumping straight into form shooting or a drill. If a player seems disengaged when they are at play, you’ll be able to address that much more quickly and positively than if they’re disengaged during practice. These are also a great throw in for five minutes if practice has hit a lull and you need a boost. We have even gone so far as to use them as part of the warm up for our fall league games when our players arrive 20 minutes before the game rather than an 50-60 minutes before as they do during the season. For levels above youth basketball, check out our post on Pre-Practice Drills For Success. Let the players enjoy their teammates while building functional movement skills at the same time. Transition games are a way to measure engagement and set the tone for an uptempo practice. I coach a small aau basketball team and I find it really hard to keep my younger players engaged. Thank you so much for sharing all of these wonderful tips, I am going to be trying them out with my players when we start training.